If you are a parent trying to sneak in extra veggies into your child's diet...or just an adult who needs to sneak veggies into your own diet (like me), then this is the recipe for you! Zucchini is one of those wonderful vegetables that can be a total chameleon. It can replace noodles, added to bread, and accompany some chocolate in these delicious muffins! For those of you worried about the presence this green-skinned squash in your chocolate zucchini muffins, trust me, these muffins are way more chocolate than zucchini. At least in taste. The zucchini actually has no taste or texture, really. It just makes the muffins super moist and extra delicious without a whole lot of extra fat or sugar. Okay, there's plenty of sugar in here, but not as much as you would expect for a chocolate muffin! First, break out your grater and grate 1 big zucchini. That should give you more than enough zucchini to add to the batter. I recommend that you let your zucchini drain on some paper towels while you prepare the rest of the batter so that you don't add too much extra moisture. Next, assemble the dry ingredients in one large bowl. Give them a good whisking to break out any lumps and bumps in the flour and cocoa powder. In a liquid measuring cup, combine all of the wet ingredients (except the zucchini). Mix the wet ingredients together to break up the egg and emulsify everything into one smooth liquid. Pour the wet ingredients into the dry and mix until it forms a very thick batter. Fold in the shredded zucchini which will immediately loosen up the batter so that it feels more like a regular muffin batter. If you want even more chocolaty goodness, toss in some chocolate chips. Scoop the batter into prepared muffin tins then pop them in the oven to bake. Note: I prefer to use an ice cream scoop for portioning out my muffins because it's a perfect size! And much easier to use! Once they come out of the even they will have risen slightly over the edge of the muffin liner and the chocolate chips will be soft and melted. Because these muffins are so moist, thanks to that zucchini, you definitely want to let them cool a bit before sinking your teeth into them. Otherwise, they will just fall apart right in your hands. Not that that's a bad thing. I am just warning you so you can either grab a paper towel beforehand or just eat them over the sink. 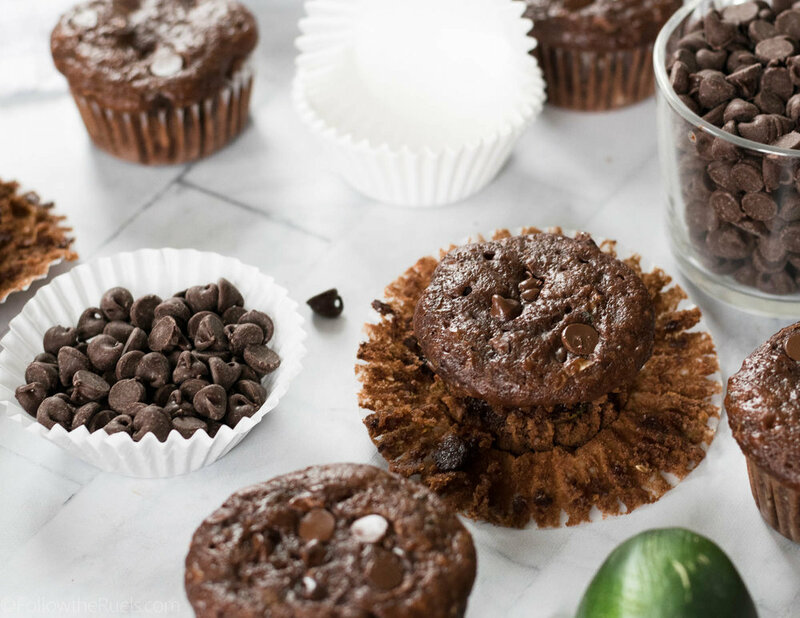 All in all, these chocolate zucchini muffins are not a bad way to sneak in an extra serving of veggies into my diet! Preheat oven to 325 degrees. Prep a muffin tin with muffin tin liners. Set aside. In a large bowl, whisk together flour, cocoa powder, sugar, baking powder, and salt until thoroughly mixed. 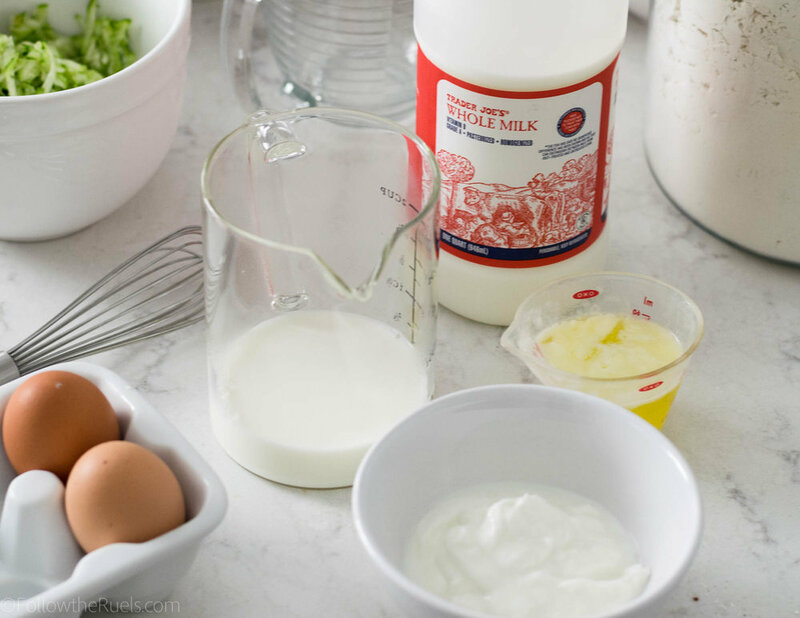 In a separate bowl or measure cup, whisk together milk, eggs, yogurt, and butter until smooth. Pour liquid ingredients into dry ingredients and mix until it forms a thick batter. Fold in the zucchini and chocolate chips (if using). Using a spoon or ice cream scoop, portion the muffin batter into the muffin tins. Bake for 22-25 minutes. Let cool on the counter for 5-10 minutes, then remove from the baking tin and let cool on a wire rack.